Meet Staff Sgt. Jeff Smith. He’s a veteran marathoner, a two-workouts-a-day gym rat, and a 17-year-Marine who saw his career hit a major speed bump when he landed on the wrong side of the infamous tape test in 2009. If a Marine falls outside the height and weight regulations specified by the Marine Corps (and data provided by manpower officials show about 14 percent of all Marines do), he or she has to submit to the tape test, which takes a tape measurement of the neck and waist and uses an algorithm to arrive at a body fat calculation. Just one problem: Experts say that number is often way, way off. Now Smith is putting it all on the line to protest the tape test. He’s hoping to get a face-to-face meeting with Marine Corps commandant Gen. Jim Amos by requesting mast up the chain of command and make a case for a new standard–one with a level of accuracy that befits the high standards of the Marine Corps. “If we’re the most elite force that does things the most efficient and the best, why would we use the tape test?” Smith told me. But he still faces an uphill battle to success. 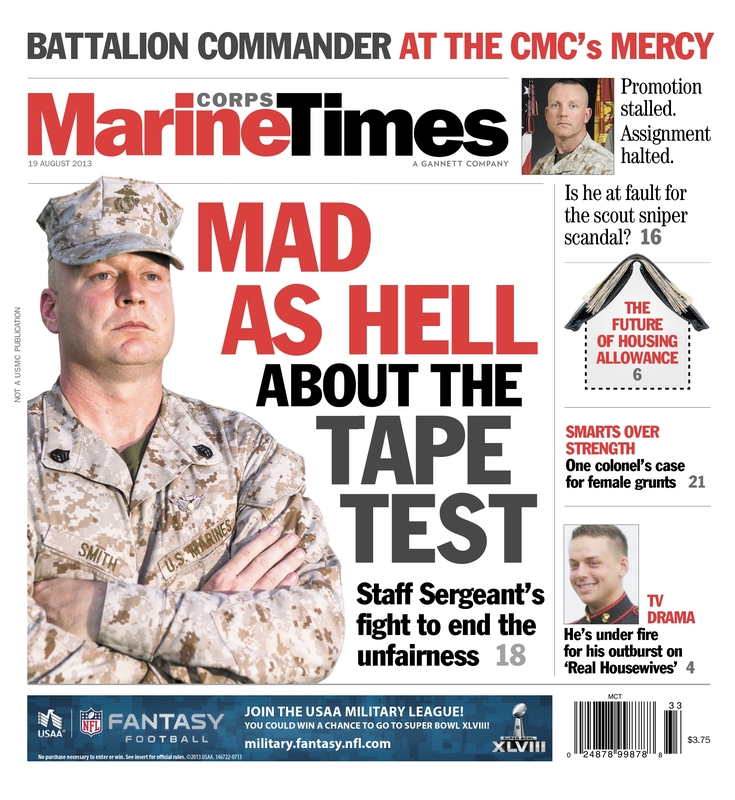 All the military services use the tape test, and Marine Corps officials said it meets service criteria because it is cheap, easy to use, and relatively accurate. Meanwhile, as the military shrinks, few services are looking for a reason to keep more troops in uniform. Smith’s best hope may be a viral movement of troops who are just as fired up as he is. Read the full story on Marine Corps Times Prime here. And let us know what you think about the tape test in the comments below. Less fat Marines?? Revamp the chowhall. How does a piece of chicken possibly have 34g of fat…but the cheese covered, thick sauced, macaroni and meat conviction has 14g…..I call shinanigans on that. If a Marine runs a first class PFT, CFT and looks good in uniform. give him the benefit of the doubt and let him/her go up to 22% like they did a few years ago. give it a rest fikany….and learn to spell. I know all about this Tape Test. The Army adopted this as everyone else and put many good soldiers out of the military because of this test. My first experiance with the weight program was with the “Pinch Test. I had to go to the Hospital with Commander referal and have it conducted. Upon completion of that the Dr. increased my allowable weight by 45lb. My Commander was furious to say the least. A year later here came the Tape Test and all who passed the Pinch Test were now Overweight according to the tape test. When I questioned the validity of the test it fell on mute ears. As everything else the Tape Test only seems to hit the enlisted ranks the most, you dont seem many field grade officers on the program as some look should be. Why the Military does not use the most accurate testing for body fat has always puzzled me. I wonder how many will fall to the tape test now that the drawdown of forces is required. As always I guess they dont need you now so you become expendable. SSgt isn’t lying i’ve seen a lot of fit marines and corpsmen clearly in shape and have to tape and you’re looking like why? Just like Sgt. Davies said they are going to use the hell out of this to get rid of good people. I wil 100% agree with SSgt. I myself have struggle with this same issue for years and it seems like no one cares. All the Marine Corp cares about is saving a buck or two. I have talked to many specialist and they all have said that this taping method is ludicrous and most unacurate. I also had the pinch method done and was 6% under what the taping method staded. Ask any service member who has had this done and especially by multiple people, how accurate it is and also how everyone may pull just a little bit more or less. It is rediculous that a half an inch may mean the end of your career especially in this SSgt’s case. After 17 years of faithful service the Marine Corp is going to destroy everything he has worked for and kick him and his family to the curb just because they want to save a few bucks. I hope for his sake and every other service members sake that our military will do something about this issue and not just brush it under the carpet. Good luck SSgt. You have thousand of service members backing you up. Semper Fi. Why not do a compromise; if someone doesn’t pass the tape test THEN use a more accurate measurement if he/she passes the other qualifications. Ok all, Now for a little truth and reality. Let’s look at this from the bigger perspective of the ENTIRE Marine Corps, rather than one or two Marines. The Marine Corps has the responsibility to ensure ALL of its Marines are held to the same standard. The tape method is not the best method and has been recognized by the Marine Corps and more importantly DOD as they are the higher headquarters that set the standard for all branches of service. If the Marine Corps went to a more accurate method, it would reduce the body fat percentage maximum by 5 or 6%. It is simple math and most do not consider that when airing their frustration with the program. Just to examine SSgt Smith and the Sergeant who aired his frustration through the Marine Corps Times several months ago. SSgt Smith has several photos in the paper and there was no mention of his PFT score, or anything to suggest his physical fitness, with the exception of his completion of the San Diego Rock and Roll Marathon in 4 hours and 22 minutes. Not a blazing speed, but a job well done. Does he do 20 pull-ups? Regardless, the test is only a test to evaluate overall fitness. The Marine himself should seek to increase his overall physical fitness by building his cardio vascular endurance, muscular strength, and overall physical endurance. Anyone can work out 7 days a week, but if they do not workout properly with a well rounded routine, then they will not loose body fat, but gain muscle underneath body fat. The Sgt from several months ago took several pictures with his shirt off and he was very well built, but you could still see body fat on top of his muscle. The regulations that govern the Marine Corps and it’s Marines are very clear, and any enlisted Marine can get out of the Marine Corps once his contract is up. The Marine Corps does not “screw” anyone over. SSgt Smith knew the regulations and obviously served better than 11 or 12 years without having this problem. He obviously made decisions (diet and physical fitness) that effected his body. The Marine Corps needs Marines, not weight lifters, body builders or any other type of athlete. The Marine Corps encourages Marines to participate in their favorite physical activities, as I myself played soccer for my unit team and regional team for the Marine Corps for the better part of 20 years. My purpose here is not to insult anyones intelligence and to create a more educated dialogue. The Marine Corps does loose great Marines, who are great at their job, but not with maintaining standards. I agree with Master Gunz…Also, a simple push back from the table does the trick, coupled with a life style of functional fitness!